Every new additional reiteration of Machete is becoming less funnier than its predecessor. Machete was funny when it was first a trailer in Grindhouse. It was mildly amusing when it was made into a feature film. 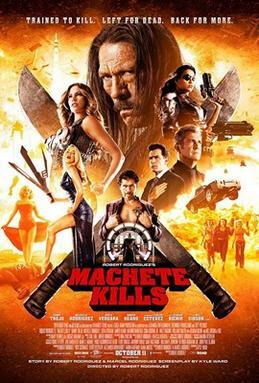 The sequel, Machete Kills, is now just a bland joke that has been worn out by its many retellings. Robert Rodriguez, the joke teller, can’t seem to get enough of his own joke. Furthermore, he doesn’t seem to care how much we like the joke at all. This film went right through me. As soon as it was finished, it was forgotten. Danny Trejo is an unique onscreen presence and I’m glad he is still working at age 69. Trejo has shown range in many of his supporting roles. Unfortunately, Rodriguez uses Trejo blandly as the film’s straight man, having react deadpan to the supporting cast of crazy cartoon characters surrounding him. Much of the film’s gags feel cheap, and it has nothing to do with b-movie irony. The most noteworthy example being the El Chameleón character, an assassin who is a literal shapeshifter, is a cheap excuse to open up guest star spots to help market the film. See? This all seems funnier to Robert Rodriguez than it is to the audience. Robert Rodriguez claims to like his characters, and proceeds to populate his film with a cast of supporting characters that are on the surface visually interesting, but doesn’t do anything with them. It’s as if Rodriguez is perpetually trying to sculpt the perfect action icon, but never delivers the pathos to fully sell the character. Instead, the characters are all handled in a throwaway fashion, tossed aside once their iconography is fully formed. The saving grace of Machete Kills is Mel Gibson, who really devotes himself to the role, milking his dialogue and sells his Bond villian-like character as if he were playing Macbeth. Gibson’s performance matches with the film’s ridiculous tone, but adds that missing pathos that Rodriguez is unable to provide, making every other actor slapdash by comparison. But when Gibson’s Luther Voz claimed to be a Star Wars fan who decorates his evil fortress with Star Wars memorabilia, I gave myself a light face palm. Evoking Star Wars as a source of humor is just about the lamest joke in the book. That’s how this film slashes itself (pun intended). It is lazy and half-assed; it doesn’t know what to do with its own talent and has expended all of its irony. It’s sad to see Robert Rodriguez fall to this level. He is a very capable and multi-talented filmmaker who can shoot, score and edit, but maybe he just shouldn’t write his own scripts. I do not care about the upcoming Machete Kills Again… In Space. Please wow me with Sin City: A Dame to Kill For. Calvin Weir-Fields (played by Paul Dano), a struggling novelist trying to recreate the early success of his first novel, writes about his ideal dream girl, Ruby Sparks (played by Zoe Kazan), who comes to life. Ruby Sparks is pretty consistent with its story beats as it journeys through the sweet and the bitter parts. It certainly hits its mark of being a quirky, cute and funny indie film but ultimately it isn’t as deep as the filmmakers think it is. For me to totally indulge into the fantastic dream girl along with the Paul Dano’s Calvin, the film has to make the audience fall in love with the Kazan’s Ruby Sparks as well. I personally did not find Ruby Sparks attractive or fascinating enough in that context to entertain that notion. Having a quirky girl be the perfect girl simply isn’t enough. We don’t know anything beyond Ruby’s quirks because she is a fictitious shallow creation. The way Calvin is fascinated with her is like the way Joseph Gordon-Levitt gets fascinated by Zoe Deschanel in (500) Days of Summer because she likes The Smiths. 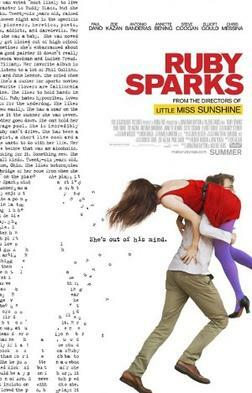 For any guy who has learned the life lesson of “idealizing the perfect girl” will find nothing profound in Ruby Sparks. I saw where the story was going right from the start, and then eventually the story went exactly to that exact predicted conclusion. The color scheme is noteworthy. I noticed how they color coordinated Calvin’s clothes and home to be more bland. The standard practice of cinematography dictates one should never shoot white walls. They meant for it to look bland for story reasons, but cinematographer Matthew Libatique does a great job with making an entire interior of white walls interesting with natural lighting. There is an indulgent approach on the filmmakers’ part. The dream girl is being played by the screenwriter and it seems the directors got the job because they directed Little Miss Sunshine, so they’re basically here to decorate the film with quirks. This is a piece that needed more aesthetic distance from its makers. What I really wanted to see happen was Calvin to come back to reality and date a real girl. Or better yet have Calvin also see a real girl and be forced to choose between fantasy and reality. There are some half-developed themes here, one noteworthy idea about how Calvin has complete control over Ruby with his typewriter. It takes the film to a darker place, which was interesting, but it was took too long to get there and the final message of the film seems to be truncated to “don’t idealize girls” instead of “live in reality”. It’s like the story doesn’t give its characters a big enough problem to push the story further to a more profound conclusion. It just needed something more. At the film’s final scene, it didn’t seem Calvin learned anything from the events of this movie. Subsequently, I didn’t learn anything either. If you ever owned a DVD of a Woody Allen movie, you will know that there are never any special features. There is probably no budget for a behind-the-scenes documentary crew following him around on his film shoots, heck, Woody Allen has said he does not even like the concept of special features. He even burns the deleted scenes after the film is completed. Up till now, the only way to truly learn about Woody Allen’s process was through books. I own Conversations with Woody Allen by Eric Lax (who’s in the film as his biographer) and Woody Allen on Woody Allen: In Conversation with Stig Bjorkman, which both are all fine reads and great insights into Allen’s creative process. I knew most of his stories: his workman-like approach, his approach to casting, , . The structure of the documentary is tailor-made to its subject and it really fits. It chronicles Allen’s life from his career transitions beginning from a young joke writer to stand-up comedian to a filmmaker. Much of Allen’s frequent collaborators and family are interviewed, including his sister, actors, co-writers, casting director and producers. Each film that he’s made is covered more or less but much more emphasis is placed on his creative phases: his early funny films, the transition with Annie Hall and the Diane Keaton era, the Mia Farrow era, Match Point and now the current European city phase. The behind-the-scenes section on the set of You Will Meet A Tall Dark Stranger where you see Allen rehearsing a scene with Naomi Watts and Josh Brolin in an argument scene was a real treat. Also, my top five favorite Woody films are all covered (Crimes and Misdemeanors, Stardust Memories, Everybody Says I Love You, Deconstructing Harry and Midnight in Paris), so I am a happy camper. I had a dumb dream once where I met Wong Kar Wai and he took off his infamous sunglasses, looked me straight into the eye and spoke to me. I woke up realizing I saw Wong Kar Wai’s eyes in person and felt like I knew something deeper about him because I was in his presence. That’s how this documentary made me feel. Despite that my previous knowledge, I didn’t know anything about Woody Allen in terms of a human being. The documentary offers that close proximity as we basically hang out with Woody Allen for 3 hours. We take a trip with Allen around New York visiting various locations like his cutting room, his old elementary school (which he hates), the jazz club (where he plays the clarinet every Monday) and the local cinema he used to frequent (inspired the idea for Purple Rose of Cairo) and we see the space of his own world and can visualize where the genesis of his ideas come from. One major highlight is when we’re in Allen’s actual home where he shows you his typewriter and takes out his notes for story ideas and reads out a few of them. It’s an absorbing experience as we gain great insight into Allen as a human being and an artist. It totally makes up for the lack of special features for every Woody Allen DVD. A highly recommended experience for fellow Woody Allen fans.